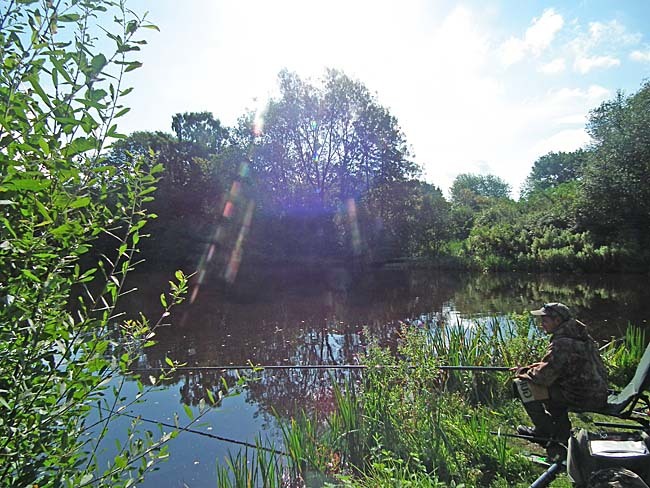 Paul Nicholls, fishing at Hevingham lakes, August 2011. I first met Paul Nicholls as a student on a bushcraft course I was running a few years back. I was impressed by his enthusiasm and I clearly remember conversations I had with Paul about fishing techniques. He is a keen angler, knows much more about modern fishing techniques than I do and is very generous with his knowledge. Paul contacted me via my blog earlier in the year. He sent me some pictures of carving and various other craft projects he had been working on. I was impressed! He had made some really nice objects. It’s great to see the evidence of his continued and growing enthusiasm for bushcraft that started on his course a few years back. Paul then sent me a story written by his wife, Lisa, about her experiences as Paul travelled on his journey of bushcraft discovery. I read the story and it certainly struck a chord with me. I really enjoyed Lisa’s writing and asked if I could share it with readers of my blog. They graciously agreed and Lisa’s story is published below. “You’d love it babe!” my husband stated with a knowing nod, as I shot him a look that said…… Really????? “ …Just you and me and the dog…..under the skies, in the woods…” he rattled on. Gone from the here and now, he had that familiar faraway look in his bright little eyes. I was thinking…….Hmm, Wolves?.. Spiders?…Rats? ….It’s a good job we live in England really, as I could not, would not, cope with snakes or deadly creatures as seen in some parts of the world. This is the state of my marriage at the moment. And it all started two years ago when I bought my husband Paul a week long Fundamental Bushcraft course for his 30th birthday, with Ray Mears’ Woodlore Company. I remember packing him off and worrying that he wouldn’t like it, that he would miss me too much or it would not be what he expected and he would be disappointed. But at nearly £700 for one week, my attitude was; you had better bloody like it! My worries were, of course, unfounded. Quite the opposite in fact. On his return, with a noticeably thinner frame, blackened face and the stench of wood smoke clinging to everything, he literally chattered for hours and hours about how great it was, how all the activities were amazing, how the instructors were Gods in human guise, in particular, one Paul Kirtley and how ‘This was IT ! This is what I want to do! I was meant to do this!’ as a recurring theme of his conversation. (I say conversation but I don’t believe I actually got a word in!) Eventually I managed to get the stinking clothes off his back and into the wash and he slept, albeit fitfully, and only after encountering my disdain when he dared to consider whether he would be more comfortable on the floor. 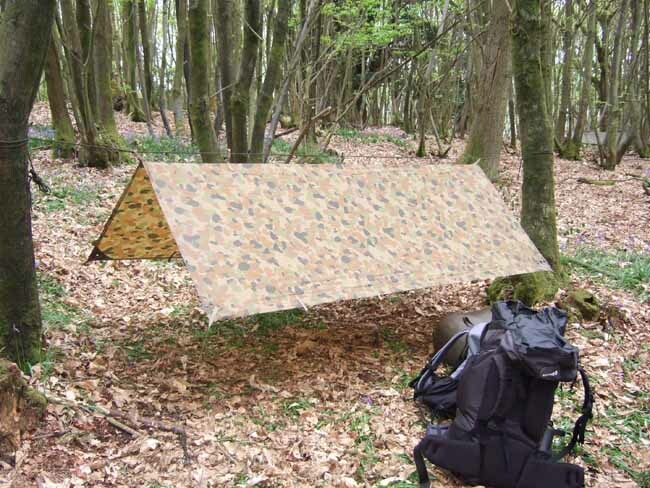 Paul's tarp set-up on his bushcraft course. From that day forward our life changed. I was shown various plants that he had eaten and/or drunk. He did eventually go back to drinking tea with proper milk although he protested for some time that it ‘tasted funny’ and he took to collecting more of the plant matter and made tea (green water) which he claimed was ‘so much more refreshing!’ Now I like a herbal beverage as much as anyone but some of his concoctions were so truly terrible that they really only would be consumed if the alternative was death itself. Even the dog got roped in, being subjected to slower walks, much to his chagrin. Now we stop frequently, not to smell the flowers, but to identify them, take photographs or cuttings and scrutinise them. We take them back and look them up in the library. Pre-Ray, this was our living room. Paul Nicholls, camping and carving, August 2011. Two years later and we have about 50 spoons, all different styles, sizes and wood. Anyone that sees them wants one. They are that good. He has gradually started to introduce power tools into his endeavours but initially this took some time as he doubted the integrity of their use when producing objects as hand-carved. We often discuss whether early wood carvers would have used them had they been available. I think they would have, they were primitive, not stupid! The tools have certainly reduced the hours that go into this work and the results are not compromised at all. Now we just have to get over the hurdle of parting with them in exchange for money. This issue is ongoing as he becomes so attached to something once it is completed that he doesn’t want to let it go. I guess a little part of him is in every piece. Family and friends have a queue forming for gifted spoons. 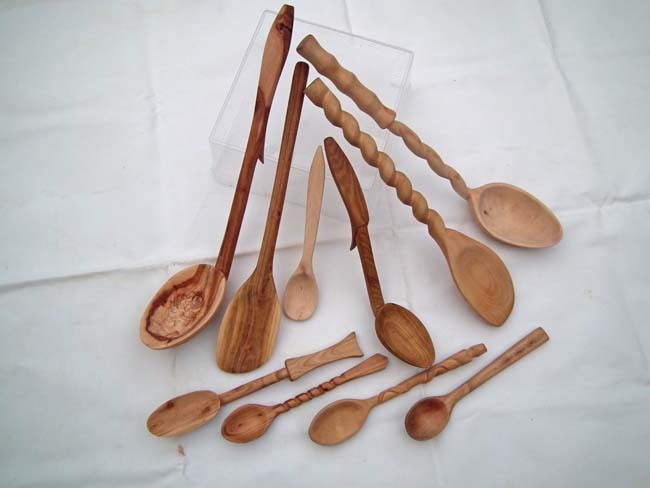 A collection of spoons, carved by Paul Nicholls. We have always enjoyed camping and we have been guilty of buying all sorts of furniture and general stuff to adorn our tent and surrounding claimed area. Of course in the world of Bushcraft this is all completely unnecessary and minimal is the mantra. So now we have pot hangers, clothes dryers, shelves and tent pegs all made from branches collected from nearby woods. At the end of the trip they can all be chucked or burnt. He has read and practised and failed and tried and tried again until he has succeeded in making fire by friction. Pre-Ray, the house was filled with the most appalling blood-curdling squeals of wood being twisted into wood and a distinct smell of scorching…but no fire. Post-Ray, the house is filled with the most appalling blood-curdling squeals of wood being twisted into wood and the distinct smell of burning! Yay! There is fire! 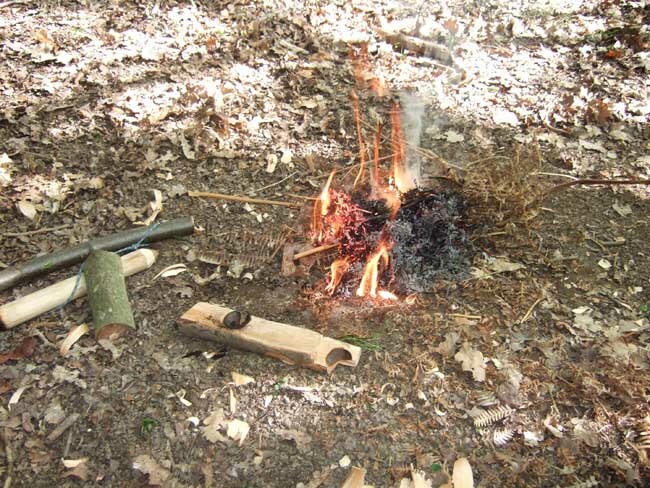 Paul Nicholl's successful friction fire-lighting on his bushcraft course. He still gets the most enormous buzz from making fire by friction and has demonstrated this skill at local country fairs and scout groups. I have to say there is something very primal about seeing fire appear in this way and it never fails to impress anyone who witnesses it. Watching the amazement grow on people’s faces and hearing the applause generated for him is really cool. He has always liked making fires, for burning rubbish or barbeques etc. Now, the making of fire is exclusively his domain and has to be done ‘properly’ i.e. : The Ray Way. Even though we live in a residential area, he will make a fire at any given opportunity and will sit in a cross-legged, supervisory position for hours on end whilst carrying out allegedly extremely important poking duties. With the dog by his side and generally a beer in his hand he is in his absolute element here. One happy bunny. One of the nicest aspects of this whole Bushcraft thing has been the people he has met along the way. Some have become good friends and offer an astounding variety of talents and skills that are shared and discussed. He met Sue on his first course. Sue is an outstanding cook whose philosophy is whatever you can cook inside can be cooked outside. And she generally can and does. Sue could take you to the woods, chop down a tree, make a shelter and rustle up the most luscious meal. She will drink you under the table with one hand and bake a cake with the other and then go home and mind the kids. Sue now works for Ray’s Woodlore Company instructing and supporting the courses offered. She has been an amazing source of support for Paul, as he has to her. She is great. A lifelong friend made. 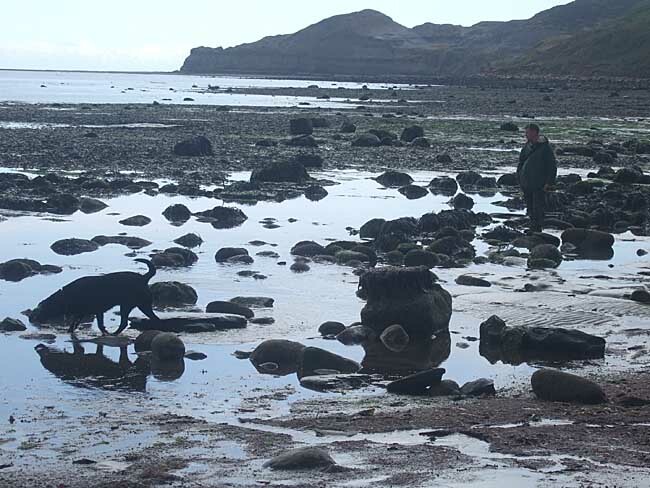 Paul and his dog, Winston, combing the beach near Sue's, August 2010. Henry, (dubbed ‘Bear Henry’) he also met on the first course. Henry shares Paul’s passion for all things Bushcraft and they often go off into the woods for hours on end or play with power tools in the back garden. Henry is a legend. A very, very clever chap, he has also become a lifelong buddy. Just the other day they were overheard having an animated discussion on the benefits and uses of ponchos. See: How to Make a Folding Bucksaw for evidence of Henry’s talent. Paul’s desire to ‘Do This!’, led to a job interview with Woodlore. It was a hard, cold, week-long interview and although he put his heart and soul into it, he was unsuccessful. One highlight however, was meeting Ray, who Paul said was a straight-talking, consummate professional, likening his craft to ‘surgical precision’. This is a serious business. Another plus was the presence of Paul Kirtley (we are not worthy!) who can be blamed or credited, depending on your view, for all the wood shavings ingrained in my carpet. 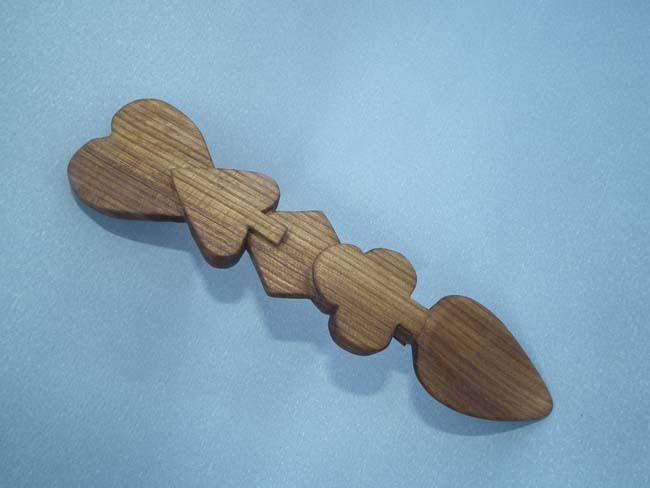 Heart, spade, diamond and clubs - one of Paul's creative spoon designs. Along with spoon-making and general woodcraft-y activities, Paul has tried chain-saw carving at which he was also very good. He really seems to have a bit of a creative side when it comes to wood and would appear to be a natural born Bodger. He has done volunteer work at a few local country parks and through this has learnt a lot about all the associated crafts and work that goes on so that the general public can enjoy such places. He finds this very satisfying and has made some good mates and gained some useful links and contacts. Paul attended a further Camp Craft course last year at Woodlore and he and Henry went to learn Flint-Knapping with John Lord. He has steered clear of recognised college courses as he is not an academic type and worries that the expense would outweigh the chances of getting a related job at the end of it. As with most country crafts there is little money to be made and no immediate or future opportunities. 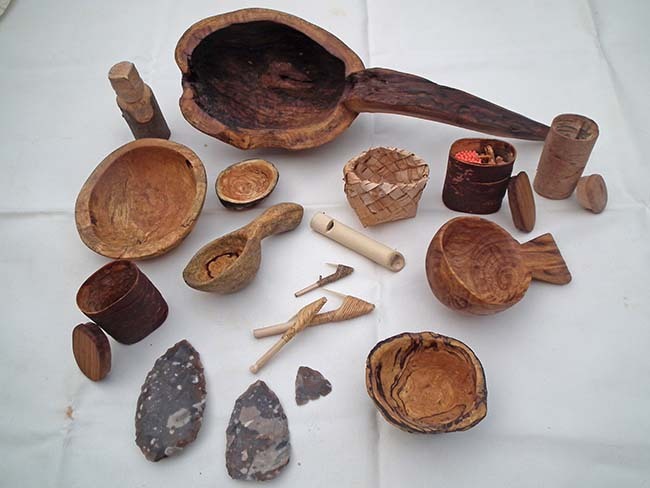 A selection of Paul's handywork, including wood carving, birch bark, split roots and flint-knapping. In the meantime, Sue and Henry still come to play frequently and he continues to carve and saw and chop and burn and create beautiful things. He has found some nearby woods where he has been given permission to camp and take wood for carving as the landowner was so impressed with his work and general attitude, so this time next year I reckon we should have about a million spoons. Hey Chad, you’re very welcome! Glad you enjoyed it. What a great story, you don’t relies were you have come from and how far you have come in bushcraft until you read something like this. This is a mirror image of my life, and i am sure for many others too, What a journey you undertake when you get into this life style. Those spoons are great some of the best i have ever seen, Paul as become a true master in the craft of spoon carving and i am sure he will make a great instructor one day, if i had a bushcraft school; i would employ him as my carving instructor without a doubt. Lisa is a great girl and a fantastic wife, not many would put up with wood-shavings all over the house, well done to them both. Good to hear how this story resonated with you. I think many of us have similar tales. You make a good point – that from time to time it’s worth taking stock and seeing where you have got to compared to where you started. Paul has come a long way and, as you say, is lucky to be supported by Lisa. Thanks for sharing your thoughts. What a great piece of writing , undoubtedly it rings true for many of us. 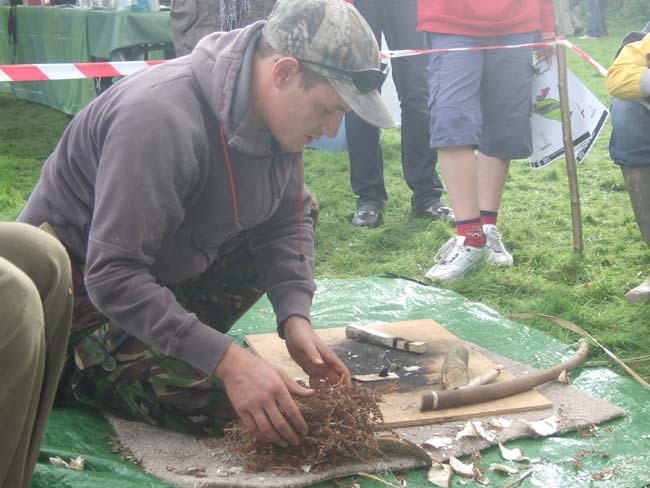 The squeal of the bowdrill , smokey aromas , pine needle teas and so many new and wonderful experiences.Bushcraft ‘soaks’ the soul in life’s simple pleasures…..
What a wonderful story, thank you Mr Kirtley for sharing this with us all, fantastic carvings Keep up the good work. Thanks for your comment. Good to hear that you found this as enjoyable to read as I did. I wonder how many other people go home from the Fundamental course with chunks of wood and only later turn them into spoons. I know I did. A nice piece of writing. I think the answer is lots of people. 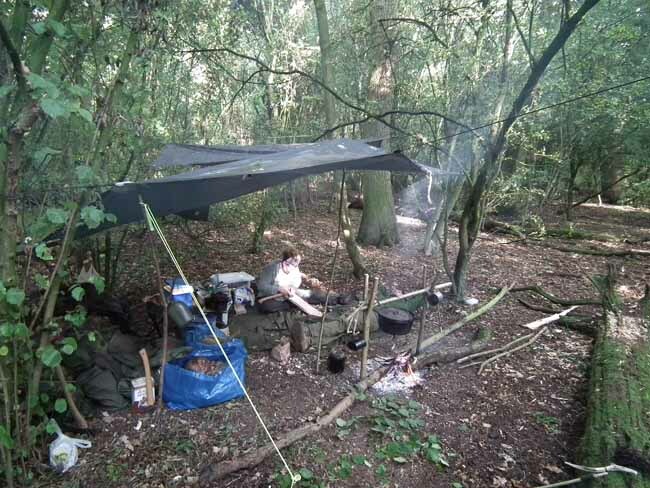 What’s great is that people feel inspired enough after their initial bushcraft course to continue with it. This is one of the main reasons I love teaching. It’s all the more satisfying when, years later, you hear from people about how they have run with it and how it has enriched their life. Experiences like this are so life changing. We whizz about in everyday life and seem to ‘exist’ quite happily , oblivious to ‘this other world’. But when we experience it and get drawn in it seems hard to imagine life without this added ‘dimension’. slight keyboard fingers and thumbs thing……….. I find the whole experience so rewarding.The true teachers of Bushcraft like Paul should be proud of what they have accomplished. Thank once more for the ‘article’…superb spoons !! I think alot of people share that same feeling of ‘this is what I was meant to do’, as, let’s face it, we were. As a species we have become disconnected from nature, and a return to it in this way connects with most people who are capable of understanding that. That is a great post Paul, i really enjoyed that story. ” Paul ” is a great spoon carver, i like his work. 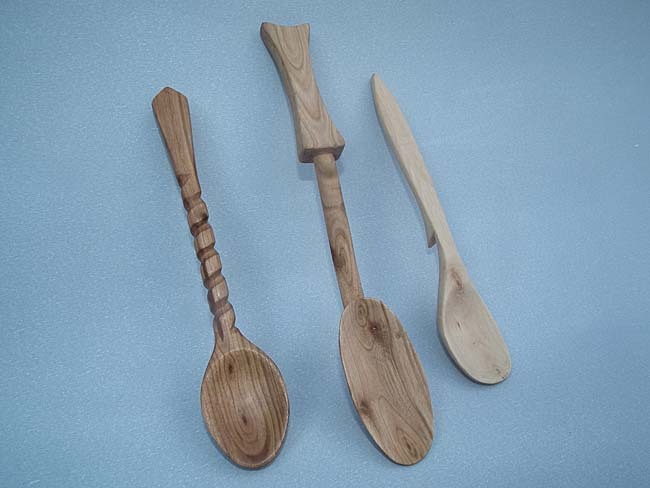 I carve spoons as well, not this involved, more for function. 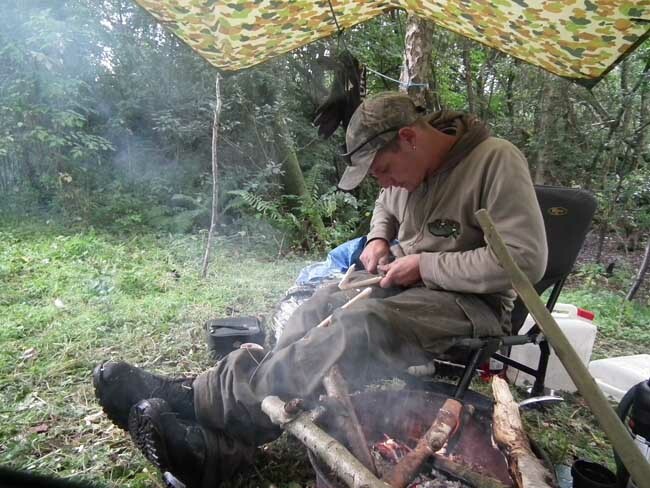 Bushcraft is more than just being able to deal with the outdoors & craft things, it is really a way of life for many. And to me a total peaceful way of life. What a lovely story, Lisa’s support is quite clear to see and was a pleasure to read about. Many thanks Paul for sharing this story. Many thanks to Lisa for sharing her view on the “other half” perspective on how bushcraft. For me spending three decades stuck up a mountain and acquiring the kit. As I type this comment my hall is filled with my kit and now i’m downsizing and what is not needed is on ebay. My wife is complaining of the noisy squeaking from my bow drill and the possible complaints we will get. Lighters, rubber inner tube bits, firesteels and flint and steel are put to the side so I can learn the bow drill. My wife raises her eyes to the sky and has a “oh no” look as I whittle the woods in the kitchen. My dog love me now as he has many wooden toys to play with. Sometimes in our quest for bushcraft knowledge , we forget those who have to put up with our insane ventures. “a lump of wood with a thick end and a thin end” Priceless! Thanks Lisa, I haven’t laughed so much in ages. There’s certainly no mistaking Paul’s craftsmanship these days. I was particularly impressed by his birch-bark match boxes when I met up with Paul earlier this year. If he carries on making things at this rate you’re going to need a bigger house . . . Brilliant. The passion is clear. Thanks for communicating this with us. What a lovely lovely story, a very enjoyable read. Paul seems to have found his passion. And the carving Looks superb! Thanks for your comment. It’s really interesting to read how central these ‘old’ skills are to your life. It’s great to know they are being kept alive and well. We should all do our part to pass these skills on to future generations. I have read and enjoyed reading this several times. Lisa has a wonderful way of telling this lovely true story. I met Paul and have to say. You don’t need to make a big noise to make a big impact. HAHA…my wife stares at me like saying: That’s you!!! That’s brilliant very well written and I can relate to this, almost sounds like it could have been my wife talking about me. I think we probably all recognise ourselves in this funny and affectionate piece…loved it! Oh my god, this is great! Thank you for sharing this and the photos that come along with the article, Paul’s carving is really something else!